It has been very warm in Winnipeg in the past few days. Today it went up to -2 C, and it felt like Spring was coming. We even went biking, which is very strange to do in January. Anyway, there were some nice redpolls and Purple Finches at the feeders. I got some nice photos, so I thought I'd share them. Here's a photo from a while ago, I've cropped it for the purpose of you guessing what it is. Sorry for my inactivity. I haven't been birding or blogging as much as I would like to. I hope to update my blog a bit and renovate the website. I haven't updated my life list and year lists in a good while, so I should do that. We're also planning a big family trip this spring, I'll tell you more about it soon. Happy New Year everybody! I thought I'd share a few photos from the past year, and sum up the year of birding for me. I've also linked posts from each notable birding experience that I blogged about this year, if you're interesting in reading more. I shall include a few photos from Florida even though it wasn't technically in 2016. We went to Florida in December 2015 and came back the day before the new year. When we got home we were greeted by some beautiful winter finches that haven't been too common the past few years, like this female Pine Grosbeak. 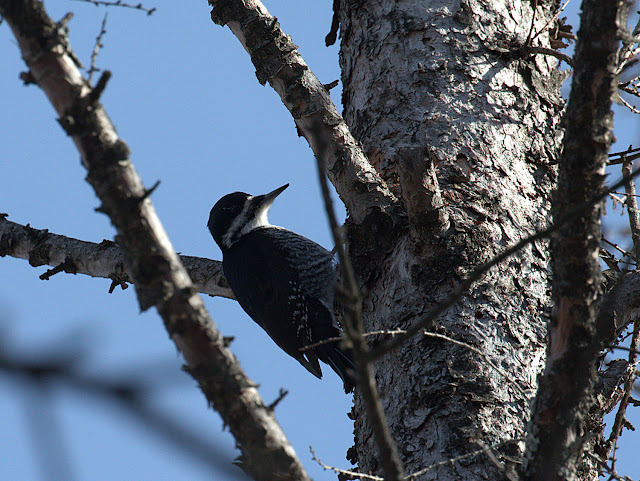 In March we went on a birding trip to the Boreal forest an hour or two east of us to look for owls and the elusive Black-backed or Three Toed Woodpecker. It was quite successful, we saw a Northern Hawk Owl, Great Grey Owl, Northern Shrike and a Black-backed Woodpecker (a lifer). Spring yielded a good amount of sparrows around the feeders. Another very exciting thing that happened was the pair Long-eared Owls returned to our property. Last year they nested right in our small woods, and the year before that they were around a lot but we didn't find their nest. This year the owlets were around a lot in June. At the end of May I did my second Birdathon! We got 127 species, compared to 90 species from the previous birdathon. Christian Artuso was very generous to help us out and come along. In June my brother William (who is also interested in birds) went to Alberta for a friend's graduation. He saw some great birds there, including a Rufous Hummingbird. When William was in Alberta some of my family and I were canoeing in Kenora (a town a few hours east of Winnipeg). In September we went for an outing to Assiniboine Park and got some nice shots of some Hummingbirds. At the end of September we went birding with Christan Artuso along the Winnipeg beaches and saw some nice birds. In November a shocking bird showed up in Pinewa, a small town east of Winnipeg. It was a Painted Redstart, the first ever record of this bird in Manitoba. We were lucky enough to see it just before it left from the area. And at last, in the middle of December we went to the Oak Hammock Marsh Christmas Bird Count. It was very cold but our team was able to see 10 species. The highlight that we saw was a Rough-legged Hawk, pretty rare at this time of year. Thanks for reading folks! That is what my year of birding was like. If you haven't seen them yet, I hope you check out the posts I linked to throughout. I hope you enjoyed it!